Doing a new cover for Airship City was something that I wanted to do anyway; I was never entirely happy with either of the first two covers, and spent a fair bit of time thinking of how I could do better. But another really strong reason was that I wanted to do a print edition with CreateSpace, and I knew that my first cover, which was also the one I liked better, was too low-res to work in print. On our relatively low-res computer screens, images don’t have to be too pixel-dense to look OK. About 75 dpi (dots per inch) looks fine. But when you get into printing, it’s a completely different story. Print is much higher resolution. 300 dpi is the norm. If you take your 75 dpi web image and print it at 300 dpi, it comes out tiny. No problem, you say, just blow it up! This doesn’t work unfortunately; the picture looks grainy at best, and pixelated at worst. The image I had created looked OK on the web but would look crude and amateurish on the cover of an actual book. So I had to create a new image, from scratch, at some pretty high resolutions. Because I wanted an image that would wrap around the entire book (one image for the whole cover, front, spine and back) I needed something really large that I could crop down. I decided I needed something at least 8,000 pixels across. If you have a good digital camera you can of course take images with this sort of resolution. And for a while I toyed with the idea of finding a model, getting steampunk props on Amazon, and taking some images that I could marry up with suitable backgrounds in Photoshop. But then I decided to do it all with the computer. I’ve been experimenting with free 3D software such as POV-Ray and Blender for a while, but unfortunately, building scenes and models from scratch takes an enormous amount of skill and artistry. I’m not there yet and may never be. The alternative is to use commercial 3D software which can be expensive. But then I discovered DAZ Studio. DAZ’s approach is different. Instead of paying a fortune for a 3D app that includes thousands of professionally designed models and scenes, you can download DAZ Studio for free. It comes with only a few simple models, but it’s enough to learn the basics and make some serviceable scenes. 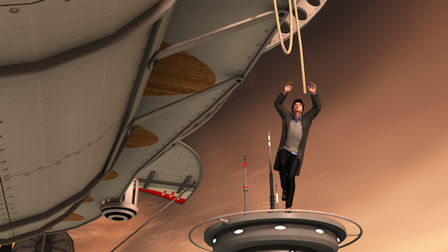 If you then want something more sophisticated, you can buy individual models on the DAZ marketplace. 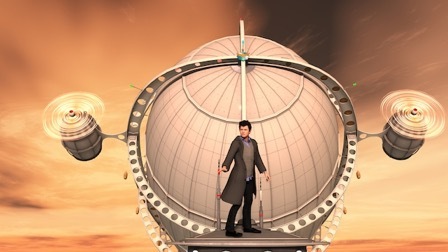 So for my cover image I bought a nice airship, some different clothes for my Joseph figure, and a sky sphere that gives the cloud background. Instead of paying hundreds of pounds for loads of models I would probably never use, I paid only a few pounds for the ones that were exactly what I wanted for my project. 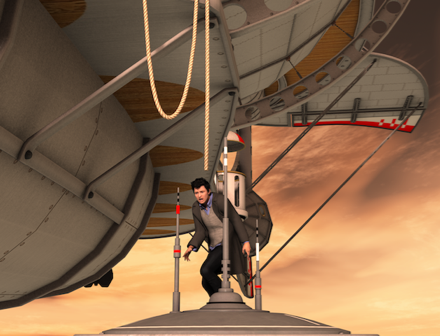 And of course the brilliant thing about 3D software is that you can render the image to whatever resolution you want. Higher resolutions take longer to render but on my MacBook Air, the large images never took more than an hour to render. A quick pass through Pixelmator to add the titles and blurb, and I was ready to upload to CreateSpace. The great thing about 3D apps like DAZ Studio is that you can try out different ideas, camera angles, figure poses, etc, as if you were in a completely controllable and infinitely scalable photo studio. I tried out quite a few concepts before settling on the final image. Although better, I was now concerned about how the image would wrap around the book. 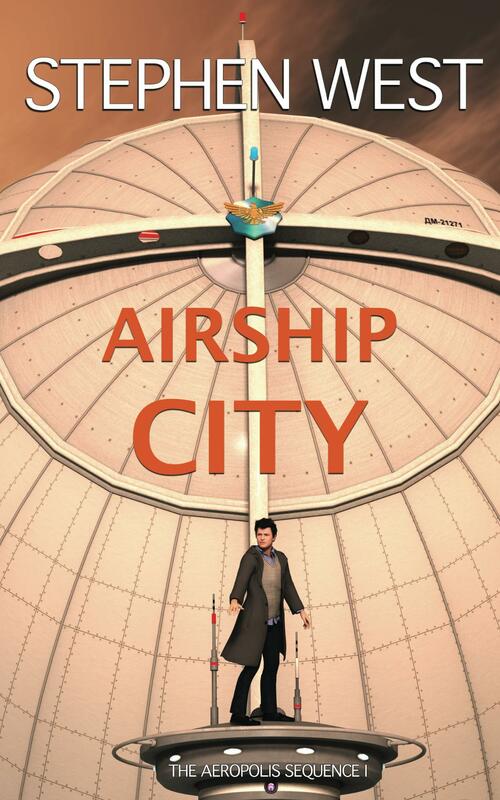 Most of the airship would now be on the back cover, and I wanted it on the cover. This is the final image in full width. Centering the airship on the cover put the one side of it and the left engine nacelle on the back cover.